Vomiting and elevated liver enzymes. I don't know the appropriate name for my dog's breed, but I have e-mailed you a picture of her so that you can see for yourself. Around 2 weeks ago she began vomiting once or twice a day. 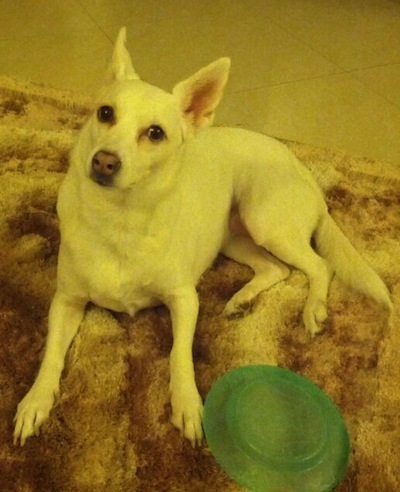 I went to the local vet (in Karachi, Pakistan) after a couple days because I thought the vomiting was just routine and would stop. However it didn't and she would keep throwing up white clear foamy liquid (no food) in the middle of the night from her sleep. So I took her to the vet after a couple days and got a blood test done. Meanwhile I started giving her a syrup to stop the vomiting. As long as I kept giving her the syrup she would not vomit but as soon as I would stop she'd vomit again. When I got the CBC report and showed it to the vet, he said all was normal except for an infection. He gave an anti-biotic along with another medicine to stop the vomiting. I kept giving her both medicines until the fifth day when I just gave the anti-biotic and skipped the medicine responsible for stopping her vomiting. That night she vomited again. So it seems the anti-biotic did nothing to stop the vomiting. If the vomiting was being caused by the infection and the anti-biotic had started fighting the infection then surely she should not have vomited after just skipping a single dosage of an anti-vomit? Other than all of this, she hasn't lost her appetite and her urine and stool seems to be fine. She goes to the "bathroom" like normal. This morning though there was white foam around her mouth and she was very slouchy and lazy. She's better again now. However I'm so at a loss here as to what is going on. It's been 2 weeks. I have sent you the CBC report along with her picture. Please let me know what else you know to get a better understanding of her condition. This is a tough question to answer. I'll give you my thoughts on what you have written and sent to me. 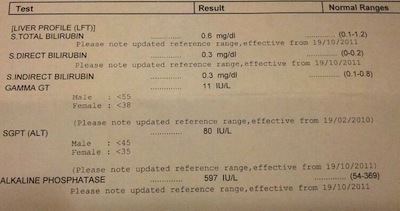 The lab results you have sent me are not actually a CBC. A CBC looks at the dog's red and white blood cells. What you have sent me are actually liver values. I am guessing that these tests were run in a human laboratory. The reason for my guess is that the cholesterol test talks about whether or not there is coronary artery disease and this is something that we don't see in dogs. The cholesterol level of 308 is actually in the normal range for a dog. 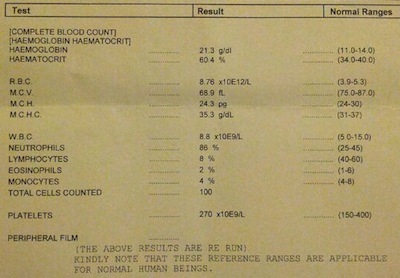 Total bilirubin of 0.6 mg/dl - This is actually a little higher than the normal for dogs of 0.3 mg/dl. The other "bilirubins" are just other ways to measure this liver pigment. GGT 11 U/L which is higher than the normal of 6 U/L seen in dogs. ALT of 80 which is normal for dogs. ALKP of 597 which is higher than the normal of 141 for dogs. What I see from this are some mildly elevated liver enzymes, but it doesn't tell me exactly what the problem is. The problem may not be even related to the liver. There are many possibilities for what could be causing Marley's vomiting. The elevated liver enzymes could be a sign of pancreatitis. If she has pancreatitis then continuing the anti-vomiting medication for a while may help. If she is still eating then it is not likely that she needs in hospital care. Another possibility is if she has eaten something that is now stuck in her stomach. A blood test would not tell us about this. Xrays may be helpful. It could be that she has some type of infectious disease such as leptospirosis. However, she would probably be acting sicker. In fact, if she really did have liver disease and that was what was causing her to vomit then you would expect her to be off of her food and lethargic. My next step would be to do some xrays to go looking for some type of foreign object in her stomach. I wish I could offer you more. Cases like this are tough! Thank you so much for your prompt assistance! I acted upon your recommendation and got an X-ray done. Will be picking up the report later today. Dr. Marie, the report I sent you was wrong. I've sent you the correct reports to your email now. Please have a look and let me know and I'm really sorry for the inconvenience! BUN and CREA are kidney enzymes and they are perfectly normal values for dogs. The ALT and ALKP are liver enzymes and are perfectly normal as well. The HCT is something called hematocrit which tells us about the red cell level. Normal for dogs is up to 55% so 60% can mean that Marley is a little dehydrated. The next thing to look at is the White Blood Cell level (WBC). 8.8 is perfectly normal for dogs. Neutrophils are a big component of the White cell level. However, for dogs we don't usually look at the percentage, but rather the absolute number so it's hard for me to interpret this. The rest of the results look normal to me. It's hard to say why your vet felt there was an infection there. However, I never want to contradict a vet as they have all of the information in front of them and I only have a little. So, I would say that these results tell us very little other than mild dehydration which is likely caused by the vomiting. I hope the xray determines something!